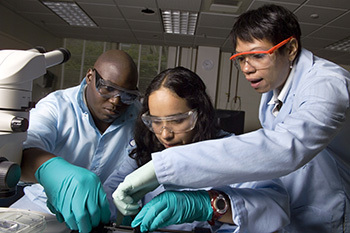 From left: Hailee Hettrick '17, mechanical and aerospace engineering; Jose Tiburcio '16, operations research and information engineering; Iyore Olaye '16, chemical and biomolecular engineering; Jovana Andrejevic '16, applied and engineering physics; Rahul Shah '16, computer science; Taylor Wright '17, operations research and information engineering; Nina Andrejevic '16, applied and engineering physics; Maurilio Nunio '16, mechanical and aerospace engineering. Engineers are smart, creative people. Traditionally they work behind the scenes, innovating and solving problems. Ezra Cornell was supposed to be one of those anonymous engineers. Contracted to establish the first city-to-city telegraph line in 1843 (from Washington, D.C., to Baltimore), Ezra Cornell hoped to usher businessman F.O.J Smith – co-owner of the telegraph patent with Samuel F.B. Morse – into the history books. Instead, Smith backed out of the venture. Cornell was undeterred. Using his knowledge of agriculture, business, and mechanical and electrical engineering, he built the telegraph line on his own terms. He created his own company, amassed a fortune and used those resources to found his namesake university. Ezra Cornell's entrepreneurship has inspired Cornell University's College of Engineering to lift the curtain and showcase its great problem solvers by offering academic programs designed to help its enthusiastic students blossom into engineers who thrive in the limelight and become leaders proud to take center stage. Ask Lance R. Collins, the Joseph Silbert Dean of Engineering, what excites him most about the learning experiences of today's young engineering undergraduates, and he might tell you it's the contrast they make with his own memories. Collins recalls that the chemical engineering curriculum in his era was highly theoretical, with precious few opportunities to learn practical knowledge. In one particular Princeton class, he says, a senior faculty member felt Collins and the other students needed to learn something about the real world. "So he brought in a wheelbarrow filled with valves," Collins says. "As we passed the valves around, he would say, 'This is a gate valve. This is a globe valve.' That was my experiential learning," he adds with a chuckle. While that attempt at hands-on learning may seem meager by today's standards, Collins says his professor was on to something. Engineering education at elite schools such as Princeton and Cornell had strayed too far from their practical roots. During the Industrial Revolution, engineers designed structures and machines to house us, protect us, provide mobility and reduce our physical labor. The discipline was practical. However, as the desire for more sophisticated technologies grew, accelerated by two world wars, there was a need to diversify the disciplines as well as to develop their underlying foundational principles. Engineering began to resemble its parent disciplines, the basic sciences and mathematics, in terms of its rigor and analysis. "What I'm seeing in the last 10 to 15 years is that the pendulum is starting to swing back," Collins says. "Students are interested in designing solutions to real-world problems. But as we're moving back, we're taking advantage of the incredible tools of today – tools such as simulation software and 3-D printers. It's going to be a glorious return because of all the hard work over the intervening century." 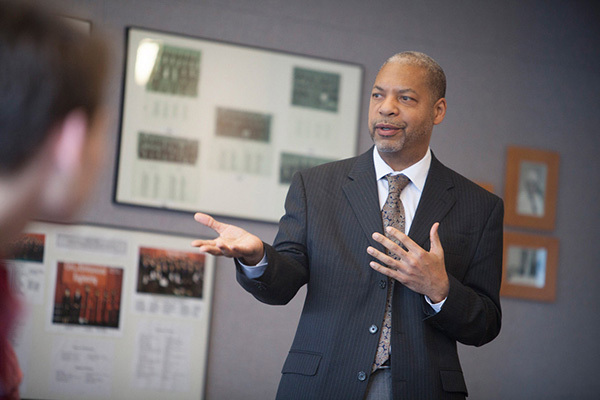 It's a return in which Collins sees Cornell playing a lead, and a shift he believes will benefit young students with a passion for learning. "We're not walking away from the rigorous curriculum we have here at Cornell," Collins clarifies. "There's still a lot of benefit to the traditional classroom, it's just that the classroom is undergoing a lot of change. Part of what we're beginning to pilot is the notion of having blended classes with some of the activities focused more on applications." 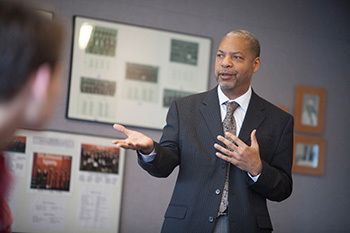 Collins says application-based, or "experiential," learning teaches students to think differently about the material they're studying, and can encourage students to break the established rules, get out of the classroom and, like Ezra Cornell, question deeply held assumptions. Cornell's first attempts to run a telegraph cable from Washington, D.C., to Baltimore, using a patented plow he created to both dig the trench for and lay the lead pipe-enclosed wires, failed because condensation gathered in the pipes, compromising the wires' insulation and shorting out the electrical current. Fearing he would lose his money, Smith backed out of the project. Cornell was convinced he needed to challenge the conventional wisdom of burying the cables underground, so he hit the books. After spending a winter studying electricity and magnetism in the Patent Office Library and the Library of Congress, Cornell had his solution. He invented and patented a glass insulator to connect cable wire to supporting poles without shorting out the electricity. The above-ground method proved successful, and on May 24, 1844, Morse tapped in code the first-ever message carried through telegraph: "What hath God wrought." "Sometimes you have to be presented with a challenge you've never seen before," says Jonathan Butcher, associate professor of biomedical engineering. "It's like people who work in industry and then come back and get their advanced degree. They're so much more motivated and aware of all the things they wish they knew." And that's the goal of Cornell Engineering's new biomedical engineering (BME) major, which is enrolling its first students this fall: to present hands-on challenges so students can see, upfront, the applications of what they're learning. The new major comes at an exciting time for the college, which recently received a $50 million gift to expand BME into the Nancy E. and Peter C. Meinig School of Biomedical Engineering. The Meinig family's generous gift not only will enable the new curriculum, but also will provide for new faculty, students, lab space and funding for biomedical research, says Marjolein van der Meulen, director of the Meinig School. "The gift is important and allows the growth that we need for BME to succeed," she says. "The flexible nature of the endowment will be key." Building a major from scratch is a unique opportunity, and department leaders hope to shape the curriculum around existing strengths while designing an experience that is fresh, innovative and different from what peer institutions offer. 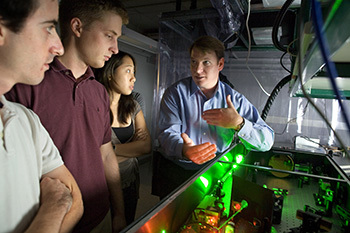 "Biomedical engineering is at a much earlier stage of development than other engineering disciplines," Collins says. "What's exciting to me is Cornell is going about it in a way that I think may actually define the discipline. It hasn't been defined yet, and whichever institution does play the most significant role in doing that will immediately rocket its program to the top." Butcher, associate chair of the Meinig School, says traditional biomedical undergraduate programs don't offer "deep" classes because students must first learn so many aspects of biology and engineering to build their expertise. "We really reject that mode of education. But to do that without taking 50 credits a semester, students have to figure out what they want to take." That's why the new BME major offers four concentrations: biomaterials and drug delivery; instrumentation and imaging; biomechanics; and molecular, cellular and tissue engineering. Butcher says in each concentration students will see applications for their education as early as their freshman and sophomore years. "You're going to start by learning an equation for, as an example, cartilage lubrication. Very complex, graduate-level theory, but as an undergraduate you're going to play with it and see what it predicts in different conditions. In doing so, you're now going to become aware of all these different sources of variability, its limitations and assumptions, and now you're more motivated to learn the deeper underpinnings going forward," says Butcher. "We are trying to more deliberately include professional development skills in the curriculum and integrate classroom learning with community activities and projects," van der Meulen says. "In fact, we received an Engaged Curriculum Grant from Engaged Cornell to pilot this integration in a new sophomore engineering distribution class being taught by professor Mike King this fall." Engaged Cornell is a new, universitywide effort to integrate community engagement into every student's academic learning experience, and the program gave out its first round of grants in September. A metal box sits ominously inside a see-through chamber the size of a large closet, as if it had been quarantined by a bomb squad. Wearing a hair net, latex gloves and a lab coat, Hailee Hettrick '17 carefully steps into the chamber and points at the nearly 2-by-2-foot cube, noting, "this is set to launch into space in October 2016." As a mechanical and aerospace engineering major, Hettrick spends much of her free time in the Space Systems Design Studio working on Violet – a high-agility nanosatellite designed to demonstrate a new method to steer spacecraft. It's scheduled to launch next year as part of the Orb-7 flight contracted by NASA and could change the way future satellites are designed and operated. Hettrick, program manager for the satellite, coordinates the student project team working on Violet's different systems. "I've gotten to dabble in areas of engineering outside of my own major, and it's become clear to me the work I enjoy and the work I don't, and the type of technical challenges I like tackling," Hettrick says. "Being on Violet certainly has helped create a more definitive end goal for my career." Because of her experience, Hettrick already has made important connections in the aerospace industry. Aside from overseeing the satellite's progress, she also maintains relationships with outside stakeholders like the Air Force Research Laboratory, which she calls "our ticket to space." Other organizations like NASA and Boeing also sponsor the project. Hettrick even landed an internship last summer at Ursa Space Systems – an Ithaca-based startup aiming to design, build and launch affordable satellite systems that can supply important data to clients. "It's unbelievable," says Hettrick of launching Violet into orbit. "Working on a satellite that's going into space is more than I ever expected out of my undergrad education." Collins says he'd like to see all students engaged outside the classroom. He says experiential programs, or "learning by doing," are among the best ways to keep young engineers passionate about STEM fields. "Our peer institutions, frankly, don't offer student team experiences at this level," he says. "Cornell got way out ahead of the pack, and we've been steadily building up a portfolio to the point now where over 900 engineering students are participating in project teams," says Collins, adding that that amounts to over a quarter of all undergraduate students within the college. That number is expected to grow with the implementation of Engaged Cornell, which will fund new and existing programs that marry classroom learning with real-world experiences. Perhaps the quintessential example of such a program is AguaClara. 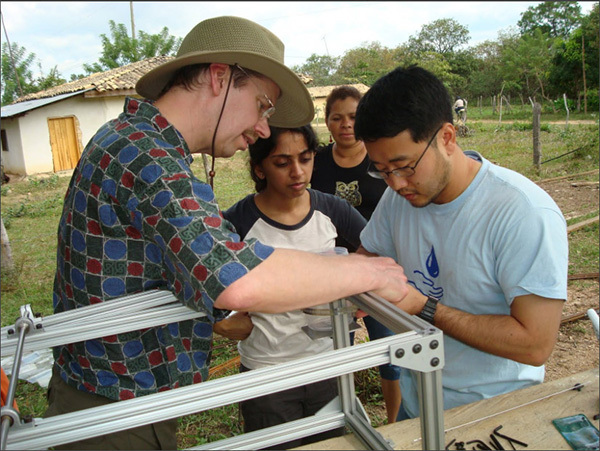 Students in AguaClara research and design sustainable water treatment systems for small cities, towns and villages in countries including Honduras and India that lack a reliable source of electricity. The water treatment systems are hydraulically designed so that water moves through the facility by gravity and is purified without using any electricity. Since its founding in 2005, AguaClara has provided clean drinking water to more than 45,000 people. 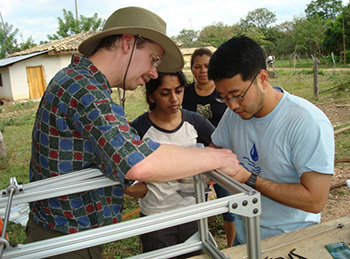 Monroe Weber-Shirk, senior lecturer of civil and environmental engineering and director of AguaClara, runs the program under the motto "research, invent, design, engage," and says student teams do lab research on specifics of the technology, learn the cutting-edge engineering involved with building the treatment plants in his theory course, and are invited to travel to Honduras to see, firsthand, their engineering in context. The international experience can be life-changing and further motivates students to improve water treatment technologies when they see how they are improving the quality of life for others. Weber-Shirk says students are consistently making discoveries and inventing new ways to advance water treatment. "They're no longer doing lab experiments where the professor knows the outcome," he explains. "The homework they're doing doesn't end up in the trash can at the end of the semester; it goes into bringing safe water to communities." That made all the difference for Abigail Brown '17, a biological and environmental engineering student who was planning to switch her major to natural resources because she felt it would allow her to have more of an impact on the world. But after joining AguaClara, Brown says she decided to stick with her original choice. "I really loved learning in an active setting and creating things that would directly impact the lives of other people. This experience gave me an idea of how I can accomplish my goals through engineering. Most importantly though, I felt like my work had meaning," she says. But Weber-Shirk says there's a problem with higher education that doesn't allow all students to have an engaged learning experience. "Students have so many requirements that this ends up being one more thing they have to add to their schedule. It would be great if the curriculum were a little more flexible," he says, adding that it's sometimes students with advanced-placement credits and a lighter course load who have the time to join project teams. That's where college leaders hope new class curricula and programs like Engaged Cornell – which incorporate community-based, hands-on experiences into time allotted for classes – can help students find time for experiential learning. In September, AguaClara's 11th filtration plant became operational, and four new plants are scheduled to be built in Honduras. Weber-Shirk has been meeting with government officials to discuss expanding the program to Nicaragua, and he is exploring the idea of creating a network of universities from other countries to expand the impact of AguaClara. After Samuel F.B. Morse and Ezra Cornell's successful intercity test of the telegraph, Cornell partnered with Morse to run lines between more cities. The engineer once contracted to work behind the scenes found himself the owner of his own company and eventually a major shareholder of Western Union Telegraph Co.
Cornell's entrepreneurial spirit transformed his role from a small contributor to a major player in the industry who would decide which cities joined a new era of communication. And even more so than in the late 1800s, that spirit can make a difference for today's engineers entering their chosen careers. "I think expectations of an engineer have grown considerably in the last 40 or 50 years," says Collins. "Today we expect an engineer to be able to start or lead a company, and so if we don't provide students with a full complement of skills, it's unfair to ask that of them." That's why he's piloting a yet-to-be-named program for Ph.D. students. It will include a new business minor, leadership training and mentorship, fellowships and the opportunity to launch a product on campus. Collins has enlisted Emmanuel Giannelis, Cornell Engineering's associate dean for research and graduate studies, to lead the program. Giannelis says some elements of the program already are being offered to students this fall. The college is continuing to raise funds and shape the program. Engineering Ph.D. programs at most colleges have remained stagnant over the years, despite a changing world and changing opportunities for graduates entering STEM careers, Giannelis says. "It used to be that the career path of an engineer was very clear: He or she would be offered a job by one of the tech giants and then would begin to receive training. Now, companies are looking for someone who can bring entrepreneurial experience to the table. Some companies are even looking to buy out smaller startups," he says. Undergrad engineering students seeking to make themselves more marketable have many options available to receive business education at Cornell, but that's not the case for Ph.D. students. That's why the new pilot program is aimed at Ph.D.s, and will build on existing programs for undergraduates, such as those offered by Entrepreneurship at Cornell. The benefits of business knowledge are clear. When Molly Morse '03 was studying for her bachelor's degree in civil and environmental engineering, she took Intro to Engineering Entrepreneurship and joined the Cornell Entrepreneurship Organization – a student group run through Entrepreneurship at Cornell that invites students from across the university to network, exchange ideas and attend conferences and workshops. 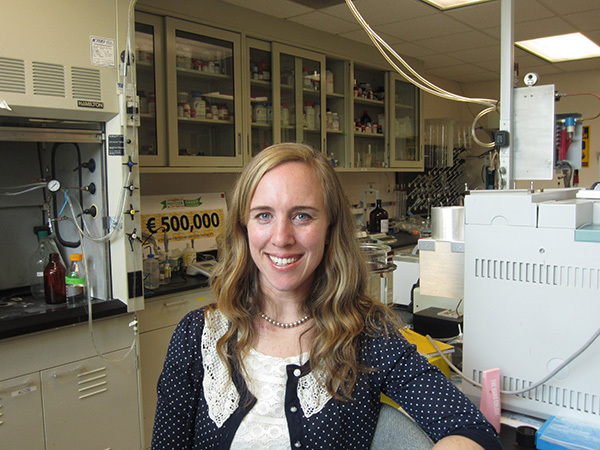 Morse continued her education before becoming a consultant for a venture capital firm. After hearing many product pitches, she began to realize the capabilities startup companies have to make a difference in the world. She decided to take a risk and start her own company – Mango Materials. Using her knowledge of bioplastics and biocomposites, Morse created a new way to transform methane – a potent greenhouse gas – into a biopolymer to sell to other companies for use in ecofriendly, biodegradable plastics. The plastics then can be used in products typically viewed as polluters, such as water bottles or microbeads found in face washes. "I definitely enjoy being a CEO more than a consultant. I get to represent a company that I believe in. When I get positive feedback, it gives me a special pride knowing that I'm doing something worthwhile," Morse says. 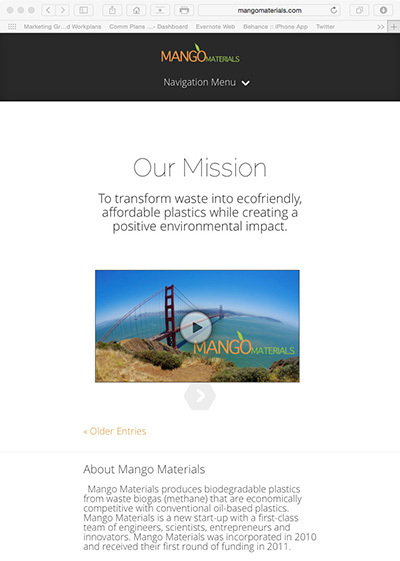 Mango Materials has earned startup funding and won several awards for its environmental innovation. Morse attributes her successful transition to CEO to her additional business education and to her confidence to take a chance: "More knowledge and education always helps, but sometimes you just need to get out there and build it." Rahul Shah '16 realized his entrepreneurial ambitions much earlier and is taking Morse's "get out there and build it" advice. 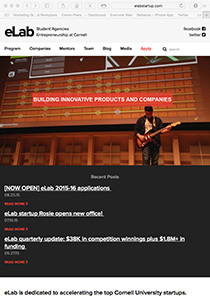 A computer science major with a passion for artificial intelligence, Shah joined eLab – an Entrepreneurship at Cornell business accelerator that offers courses and credits from multiple colleges across the university. 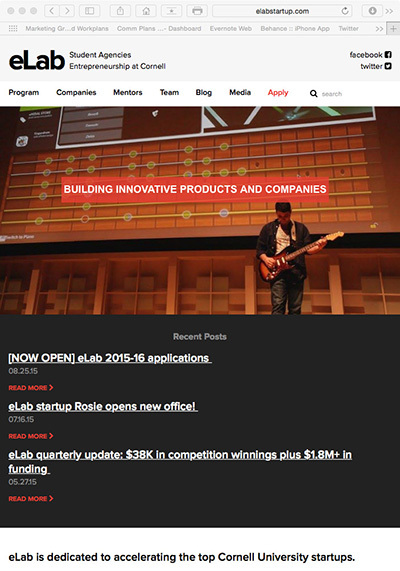 Through eLab, Shah and Christopher Goes co-founded Fox – an automated information assistant. The software can decipher specific details about digital content, such as who appears in a photo or what topic a news article is about, and then help its users categorize those files based on the details it gathers. Initially, Fox will be offered as a consumer product with the later goal of targeting enterprise information management, according to Shah. "Seeing the real-world application of what I'm learning in college has given me tremendous motivation to stay and learn more. Working on Fox has allowed me to bring a lot more context to scattered lessons learned in lectures, and as a result, it sparked a genuine curiosity in computer science," Shah says. Shah plans to launch the company later this fall and continue working on it after he graduates in the spring. He says being a software CEO is more than just being the face of a company. "I often find it valuable to be a CEO who has programmed. It allows me to more rigorously understand the technical challenges we come across and promotes a much more fluent and transparent communication channel between technical development and product strategy," he says. Many other computer science students participate in opportunities offered by Entrepreneurship at Cornell and Cornell Tech in New York City. However, not all students from Cornell Engineering's other departments have been able to take advantage. Giannelis says that's because there is a need for more specialized facilities. "If you're a chemical engineer and you want to test your product, you need fume hoods and other laboratory equipment," he says. 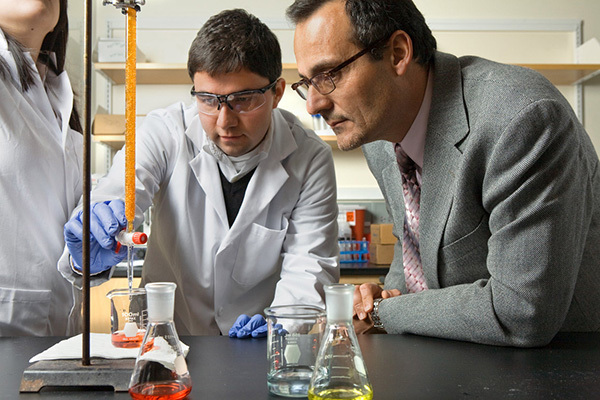 Giannelis hopes to open a new business incubator on campus as part of new Ph.D. program – one that will accommodate entrepreneurial doctoral students with unique product-testing needs. He says the plan is to have two companies occupy space in Kimball Hall in time for the program's full launch – one focusing on energy and the other on biomedicine. A soft launch for the lab is scheduled for October as part of the Center for Nanomaterials Engineering and Technology. After amassing his fortune, Ezra Cornell became a philanthropist who envisioned a university that gave educational opportunities to outstanding students, rich or poor. "My greatest care now is how to spend this large income to do the greatest good to those who are properly dependent on me, to the poor and to posterity," he once wrote. Collins says that, like Cornell, today's engineering students also are looking to make the world a better place. "I think it's generational. I think today's students have an even bigger sense of being the stewards of the Earth than my generation, and this makes them more aware of societal problems such as climate change, availability of potable water and food, and sustainable development," Collins says. This generational shift comes not only with a changing mindset, but a changing face as well. In a field traditionally dominated by men, Cornell Engineering is balancing the scale. 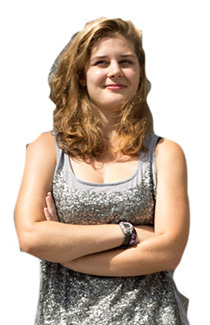 This year's freshman class is 48 percent women. That compares with the national average of 18 percent. And with biomedical engineering attracting a majority female cohort at Cornell, the new BME major soon could tip the scale further. Also, 19 percent of the College of Engineering's Class of 2019 consists of underrepresented minorities, also ahead of the national average of 13 percent. The mission remains the same: To keep young engineers enthusiastic about learning – all while molding them into tomorrow's great problem solvers. "When I entered college, student engineers could aspire to a nice middle-class living," says Collins. "Today, they see themselves as having impact at all scales. I think it's a kind of confidence that we have instilled in them."